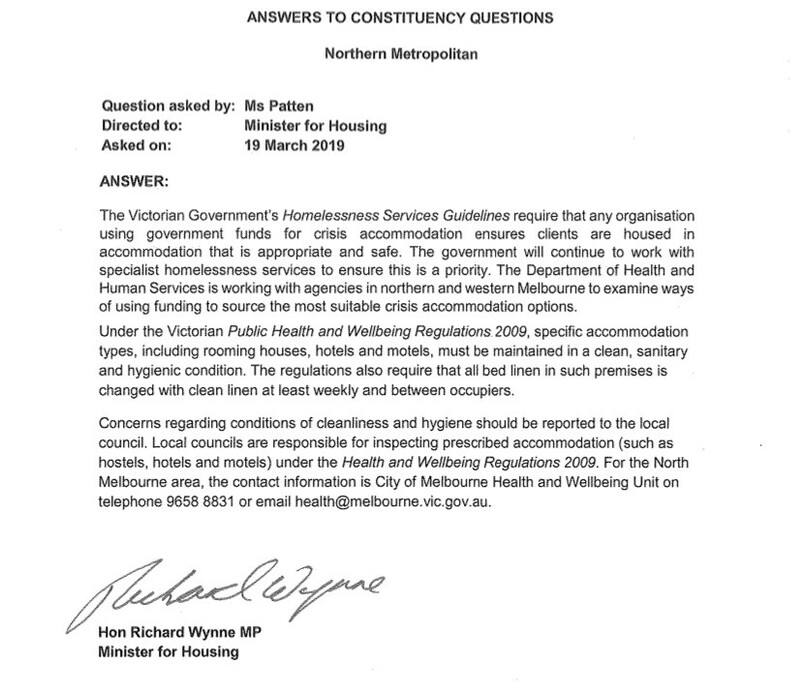 MS PATTEN (Northern Metropolitan) (17:58:55): My constituency question is for the Minister for Housing. A constituent of mine works in the homelessness sector and raises concerns in relation to the infestation of bed bugs at a number of low-cost accommodation premises in my electorate, including the Victoria Hotel in Victoria Street, North Melbourne. She explained that homeless clients are often funded for several nights of emergency accommodation at the Victoria Hotel by the government’s Housing Establishment Fund scheme. She stated that clients commonly report bed bugs at this hotel and advised that some have required hospital admission due to their severe reaction to the bed bug bites, or required antibiotic medications for infected bites. As the Age reported on 14 February, this type of problem is prevalent across crisis accommodation in northern Melbourne. My constituent asks: bearing in mind the nexus with government funding, what is the minister doing to address this issue?